Wow…what a wonderful gesture of that lady!! And in NYC, no less! 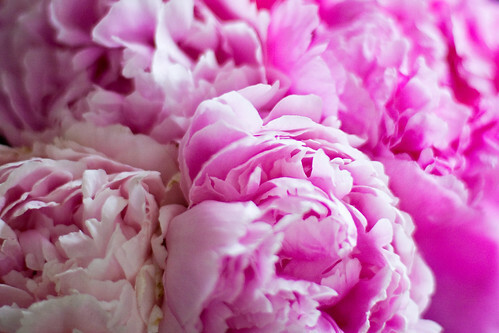 I love peonies too…wonderful fragrance. I don’t have any planted right now, though. Also, I just wanted to let you know that at Main Street Market (nee Marsh) the baggers will push your cart to your car for you, at least they do here (a lost art, if you ask me!). I hope they do in Indy!! @Amanda C, There is a little market by me where they offer to push my cart out, but it’s never where I do my major shopping so I never really need help. It truly is a lost service. Warning: must get tissue before reading this post. So great. Thanks for sharing. @Sarah, There’s losing your mind. Then there’s losing your damn mind, you clearly know the difference. I got teary writing about the tickets as well. I love nice people. Isaiah 43:1-2. Thru the water, river and fire. Some days it’s my only source of encouragement. Outside my amazing kids and awesome husband, the Big Scary of my life requires this promise. I love peonies. Damn quitters. I hear you and have been in those same shows, sister. I leave the kid at home while shopping these days. If only ever mama had that luxury. New Yorker’s rule. As do you. Hence the karma. @joules, Oh man, I remember telling my sister that grocery shopping alone was just about as good as going to the spa. She didn’t believe me until she had a kid of her own. I always read, but never comment….but today I need to say that I heart this post. I also love peonies, in spite of their lack of coping skills. Peonies are like that friend you really love but is secretly a slightly high maintenance hot mess. That’s EXACTLY what peonies are. So sweet on the tickets! So did you get to sit with the lovely lady? I cannot grow anything at our house. I planted a ton of stuff the first year we moved in and a few things came up. The next year, I planted a few more, but got even less. This year I give up. But you know what keeps coming up? The things the previous owner planted… sheesh! @Krista, We did get to sit by her! I have hostas that come up every year that were already here. I plant what I want, then at the end of the year I figure out what didn’t totally die and plant it again next year. I too want to go to a church with a witty sign out front. I don’t think the Catholics are much for humor. At all. @ClassyFabSarah, Yeah, Mormons aren’t really there either. I do think we’re ahead of the Catholics though. Next time Vivi loses her damn mind, pull your cart by the basket (like, the big front part where you put all the things), instead of pushing it. I’m sure there is some law of physics or something to explain it, but I just know it’s easier. I’ve had my fair share of those moments, so I’ve learned. @Jen, THAT MAKES PERFECT SENSE. This is why no one should ever have to parent without other parent friends. Our church has a sign out front, but not a lot of space to be witty. Tho the other day it did say “Like us on Facebook” and that made me chuckle. Bless that woman and her son. Moments like that are truly amazing and give us all hope in this sometimes dark world. @Wendy [mapsgirl], We do have a few facebook pages, and twitter accounts. I love peonies, too. I love the smell. We have a friend who let Dillan pick some yesterday to put next to her mom’s ashes. When I woke up this morning and walked downstairs, the smell came over me and it was so amazing. About Vivi, I can’t imagine how frustrating it must be. I can also see how someone could beat themselves up because they feel like they are a bad parent when they aren’t. Trust me, you are an amazing mom!!!! 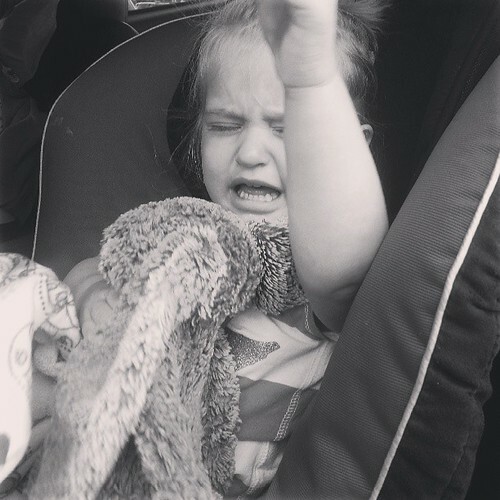 Vivi’s just going through a phase right now that just needs your amazing patience and love. You will get through this. You will survive. Just try to remember the lovely. I try to do that every day now because of you. Thank you for that gift. @Anjala, No problem, I’ll still date peonies seasonally, but we won’t be best friends until the end. Marsh will help you to your car still. There’s even a sign on the door that says something like, “We will help you to your car. This service is complimentary. Tips will not be accepted”. I’ve had them help me a couple of times and felt silly about it because I didn’t really need it. They should have been there for you. Even if that’s not where you were shopping. I have always met nice people in New York. Joe says it’s full of jerks (and that’s why he left), but I think you’ll find that anywhere. One time, when we were taking the train from his parents’ house into the city, someone gave us their round trip tickets for free. They were expiring that day and they weren’t going to use them. I knew there were nice people there. @Katie, I’m more and more convinced that NYC isn’t nearly as terrible as it’s made out to be. I was at Meijer, where they don’t even have baggers anymore. Womp. @Trixie, I haven’t moved them, I’ve just planted more at various depths and locations in my yard and all of them have failed me. One bush did get quite large this year (the original one I planted) but still no blooms. Moody flowers. growing up Mormon and being very familiar with our churches, I’m kinda glad we don’t have that tacky sign thing out front. It’s RARE that whatever saying du jour is witty and thought provoking. Mostly, it induces deep eye rolls from me. One of these days, my eyes are gonna get lodged up there. I’ll look pretty freaky, no? @Q, Heh. I can see it now. Peonies have always been my favorite! When I was little I called them “shy roses.” But Petunias are lovely too. And getting those tickets? That is karma and LookForTheLovely at its best. There is a part of me that in convinced that you got those tickets because you stood outside of Animal Kingdom for ten minutes trying to give your tickets away. Awesomeness attracts awesomeness. And … peonies have ants. Teeny, tiny ants. Just sayin’. GIve them more time – eventually your peonies will grow and then bloom. I lived in a rental for a year on Greenwood 10 LONG years ago that had SEVEN different varieties of peonies!! I still kick myself OFTEN for not taking a start from each bush. I have my Moma 3 small starts when we moved and now all these years later she has bushes growing for a good 6 feet!! I hear ya on the losing her damn mind. I have been known to hold the babe in an awkward hug whist pushing the cart. Ugh. It gets better, right? Also, you have good karma because you give good karma! So YAY for the show tickets? Newsies is a favorite musical of mine. I would be stunned into momentary silence if I could see it on Broadway. Maybe longer term silence if Christian Bale were performing on Broadway!! Happy Weekend. Oh Casey I loved everything about this. Yes, karma is a wonderful beautiful thing. 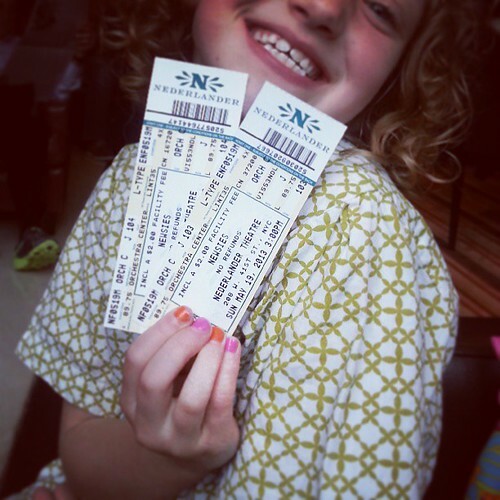 That woman so very very kind to give you her tickets!